Your donation will directly support Find Your Rhythm! – Rhythm! 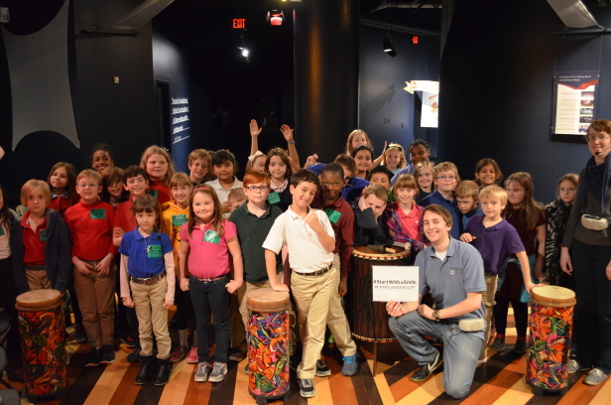 Discovery Center’s community outreach program, help maintain our world class instrument collection, and provide funding for the development of new and exciting exhibits and events. If you wish to donate historic artifacts or manuscripts from your personal collection that fit the collecting scope of Rhythm! Discovery Center, share your story with us! Please e-mail Elizabeth Quay, Museum Manager and Registrar, at equay@pas.org, or call (317) 275-9030 to discuss the objects or materials you would like to donate. We are always eager to discuss potential donations and to answer concerns or questions about the donation process. We are particularly interested in instruments that demonstrate changes in technology, historical instruments, world percussion instruments, and instruments used or created by notable percussionists. All contributions to the Rhythm! Discovery Center are tax deductible, according to IRS rules and regulations. This Fund accepts donations to help support the daily activities of the museum. Your donations to this Fund help us maintain a first class experience for thousands of visitors each year. This Fund was established for donations related to the acquisition of instruments. Your donations to this fund may be specified for the acquisition of a particular instrument, accessories, or instrument group, or type. The Ralph Pace Museum Fund is an endowed fund for the purpose of acquiring rare and unusual instruments and artifacts to enhance the Rhythm! Discovery Center collection. Founded with an initial contribution in 2007 by Ralph Pace Jr. the fund was established in memory of his father, Ralph C. Pace. Pace was an innovative and prominent percussion author, educator and inventor. A lifelong performer and teacher, he wrote eleven influential percussion method books, most notably “Variations of Drumming” published in 1949. 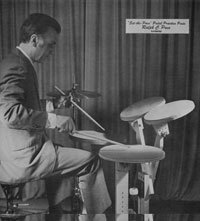 He also patented “Set the Pace” Pedal Practice Pads, the first drumset of silent practice pads made of wood and rubber that were used in thousands of teaching studios throughout the country. Instruments already acquired through the financial assistance of this fund include a special edition Ludwig World War II rope field drum and the Stephen Joseph Collection containing over 75 unique and rare antique bass drum pedals from the late 19th and early 20th centuries. Your donation to this fund will directly support future acquisitions contributing to the most significant percussion instrument and archive collection in the world. Partner with PAS and R!DC as we expand the largest and most exclusive percussion library in the United States. Thank you for investing in Rhythm! For additional sponsorship and giving opportunities, contact Executive Director Joshua Simonds via email or call (317) 974-4488.